CONT【V】: During your turn, this unit gets Power +1000 for each «Dark Irregulars» in your soul. ACT【V】: [Counter Blast (1) & Choose one of your «Dark Irregulars» rear-guards, and put it into your soul] Your opponent chooses one of his or her rear-guards, and retires it. Demon World Marquis, Amon is one of the better Grade 3s to come out of Demonic Lord Invasion (gee, I wonder why? ), and while he's largely overshadowed by the likes of Tsukuyomi and Palamedes, he's definitely worth his salt. Amon leads one of the armies of the Dark Zone nation, plotting against the neighboring United Sanctuary. During your turn, a Vanguard Amon receives 1K for each Dark Irregulars unit in your soul. He's normally sitting at around +6K the turn he comes down, but Amon could easily reach much greater heights due to the nature of the Dark Irregulars clan to soul charge like no other. This gives you the convenience of prioritzing your boosters for rear-guard columns, as he probably won't need one himself. That's certainly a good thing given the clan's general lack of an advantage engine. Amon's other ability allows you to counterblast one and move one of your rear-guard Dark Irregulars to the soul in order to retire a rear-guard of your opponent's choice. This one-one exchange holds the most potency in the early stages of a game, picking off pesky first Vanguards and boosters before they get to work their magic. Later on, the ability can be used in tandem with Doreen the Thruster to make intimidating rear-guard lanes that threaten to end the game, especially if you're sucking up used copies of Yellow Bolt. And it should go without saying, but Amon is feeding his own innate power buff in the process. The synergy here is great. Amon is a card designed on the pin of a needle. That is to say, he was designed with balance in mind, and balanced he is, almost to a fault. The second ability Amon has allows him to consume one of your own Dark Irregulars and have your opponent retire one of their own rear guards for the cost of one counterblast. This is pretty much exactly what you can expect to get for one counterblast - a one for one, a wash. It simplifies the state of the game and fuels various Dark Irregular soul charging gimmicks (such as Doreen the Thruster), but as a retiring ability it does not match up to those that the more retire-heavy clans have because your opponent gets to choose the one they lose, meaning they will almost always have a way to replace it, didn't really need it, or what have you. But, you are in the same boat, so once again it is completely even. The cool, obvious thing about that skill is that it directly synergies with his first one. 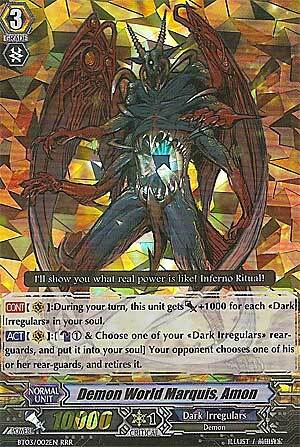 Amon gains 1000 power on your turn for each Dark Irregular in your soul. This, combined with his own other skill and the skills of a plethora of Dark Irregular units, makes it so that Amon attacks for huge numbers and only continues to grow as the game goes on. In fact, he can potentially become so large that you might not even need to boost him, allowing for even more gimmicks. For example, you could simply never have to commit a card to the spot behind Amon or you could put a Yellow Bolt there that can soul charge every turn without costing you much in the power department while also fueling Amon's strength and making Doreen the Thruster a guaranteed 9k booster at the very least every turn. It's all very cool and fun, but a gimmick is still a gimmick, and nothing here is consistent or even really very threatening to your opponent. Vanguards like Amon who have nothing but their pure strength going for them fall into the trap of "no guard or perfect guard" easily, so it's not like Amon himself is putting a ton of pressure on your opponent. And getting huge Doreens is nice, too, but making use of those columns on the average turn where you get at most one soulcharge requires very specific combinations of cards, too. Amon isn't even great defensively - he's a 10k vanguard, another example of balance (his huge offense being kept in check by his blah defense) making him less impressive than he has the potential to be. He's easily abused by the all too common 20k columns we have today. In the end, Amon's not great, but since he doesn't really do anything outright wrong and he enables his clan's skills well enough, he's not really bad, either.